I have not read this novel, Ready Player One, so as always I cannot say how close or far the film version stays to the original. I imagine as close to its creator's wishes, given the author of said novel, Ernest Cline, adapted the screenplay with Zak Penn. Ready Player One is a clear love letter to all of Cline's pop culture/nerd passions: video games, science-fiction films, anime. Here's my difficulty: I am not as enamored of those things as Cline is, so for me, Ready Player One was at times almost a tragedy than a celebration. It is 2045, Columbus, Ohio. The world is a dystopian nightmare, and the majority of the population finds life so miserable that the only way out is through The OASIS, a virtual reality universe where you can be anything. Among the denizens of this universe is Wade Watts (Tye Sheridan), who goes by the name and avatar Parzival. We learn though that The OASIS is not just an escape for humanity, the soma to those in this virtual universe. Eccentric OASIS creator James Halliday (Mark Rylance) has died, leaving his fortune and control of The OASIS to whomever can find three keys within this alternate universe. However, the clues are so opaque as to make all the 'pop culture scholars' continuously struggle to solve the puzzles; since his death there has been only one portal discovered, where the various participants in The OASIS constantly race to get through the first challenge. Parzival, along with his friend Aech (which I confess to thinking of as 'H'), follow the race, which is expensive in virtual currency, but constantly get thwarted by King Kong. Even the 'beautiful' avatar of Art3mis cannot get through. Parzival, however, is totally obsessed with Halliday, and having studied his archives soon stumbles onto a clue, something Halliday said. With that, Parzival finds a safe passage to the first key: by going under the streets rather than on them. Soon, he shares that with Art3mis, with whom Parzival/Wade has grown infatuated with, then with his BFF Aech, who then shares the secret with two of his buddies: Sho and Daito. This group, the High Five, finally placing on the scoreboard attracts the attention of the evil Innovative Online Industries Corporation. IOI head Nolan Sorrento (Ben Mendelsohn) has thrown everything at The OASIS to win the game and Halliday's fortune, but now has to play catch-up. Sorrento does have a few tricks up his sleeve: not only greater resources but a henchman, I-Rok (T.J. Miller), an expert killer in the virtual world. He could be good at his job, but Sorrento constantly gets in his way. Now the High Five continue to pour over Halliday's archives, where the snooty Curator, a robotic-looking being, guides them and makes occasionally snippy comments. The second key lies within a game meant to resemble The Shining, which again they found through a clue in Halliday's memory bank. Again Sorrento and IOI play catch-up, and more drastic action has to be taken. By now Wade's true identity is discovered thanks to his besotted nature towards Art3mis. He whispers his real name, something verboten in The Oasis, and I-Rok overhears it. Art3mis manages to rescue him from Sorrento's hitmen, and we learn she is Samantha (Olivia Cooke), whose father died as a result of his massive debt to IOI. The third and final key is in Planet Doom, but IOI has gotten there first, and I-Rok uses a spell to block anyone else from entering. It is now up to the real-life versions of Aech (Lena Waithe): real name 'Helen', Sho (Philip Zhao): real name Zhou (who is also only 11 years old), and Daito (Win Morisaki): real name Toshiro, from both rescuing Samantha and stopping Sorrento from winning the game. It means a major battle where the other gamers lead a revolution against IOI, and we get a couple of more twists and turns until Parzival/Wade wins. I was left a little cold by Ready Player One, not because it was a bad film but because I do not have this overwhelming love of all things nerd/pop that those involved in Ready Player One have. It isn't as if I don't appreciate or find some of the thousands of shout-outs amusing or good, though I do wonder if those raised on Playstations and XBoxes will get the 'Holy Hand Grenade' or even 'Zemekis Cube' references. Even if they did, I'm taking a guess they won't get the nod to the original War of the Worlds. Perhaps that would be a good demarcation line: those who do get it versus those who think the Tom Cruise version, also directed by Steven Spielberg, is the only version of H.G. Wells' novel. After all, there are some people totally unaware that the Marky Mark Planet of the Apes is a remake/re-imagining of some old forgotten film. While many find thrills with all the shout-outs, homages and nods to various films, television shows, video games and even songs in Ready Player One, which starts out with Van Halen's Jump and has the climatic battle serenaded by Twisted Sister's We're Not Gonna Take It, both very curious choices for 2045 in my view, I found the world of Ready Player One close to a horror film. This is a world where people are so drugged out on virtual reality that they let the world go to waste. This is a world where such things as 'pop culture scholars' can pour over the minutia of The Breakfast Club, Animal House and Mindcraft and those in avatars can spout this off quickly but apparently can't throw in a Shakespeare or Alice in Wonderland or Bible quote (which, per my old English teacher is where the vast majority of quotes come from). Even when you do get more 'obscure' references, such as whenever Parzival says that Halliday's lost love Kira is his 'Rosebud', it does not quite ring true: I'm not convinced that many of those gamers, cosplayers and sci-fi fans that get shout-outs have seen or heard of Citizen Kane. Again, Ready Player One is meant to be a catalog of all of Cline's loves, and those who share those great loves. I just do not happen to be one of them; even when I get the visual call-outs, and even when the film overtly yells them at me, like when Parzival 'dresses' as Michael Jackson from the Thriller video, it does get a little too on-the-nose for my liking. For me, story is paramount (no pun intended), and Ready Player One struck me as rather unoriginal. 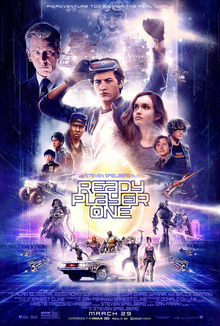 A bit of Willy Wonka & The Chocolate Factory mixed with It's A Mad, Mad, Mad, Mad World or even Million Dollar Mystery and TRON, with a hint of the original Star Wars trilogy, I still fail to understand how Ready Player One is this praised. Then again, any film that uses New Order's Blue Monday gets points in my book. We also get bad, cliched moments such as when the 'Zemekis Cube' reverses time 60 seconds, using an old trope to get characters out of trouble (example: Doctor Who's timey-wimey) and underdeveloped characters/stories (quite convenient that Wade's aunt and abusive boyfriend can get killed off, since we got two scenes with them, they can be easy collateral). Of course, the villain would be so dumb as to not only write his password down, but leave it where someone can easily read it off. We even get lousy lines: "She's hacking your heart to get into your head" has to be one for the books, as if Wade's aunt yelling, "Go to your room, Rick!" to her abusive boyfriend isn't already funny enough. Acting-wise, we got some good things. Rylance was doing an Andy Warhol meets Willy Wonka with his Halliday, the eccentric creator of The OASIS in his way-out wig and soft, meek voice. Sheridan does wonders as Wade/Parzival and continues to show himself as a young actor to watch, even if I did not think he had much to work with. For the longest time I kept wondering where I knew Cooke from once she revealed herself, and it wasn't until I saw her name that I realized she was Emma Decody in Bates Motel (aka 'the only sane character on the show). There were also some bad things: Mendolsohn was in need of a mustache to twirl as the evil Sorrento and I could have done without Miller's 'humor' as I-Rok, constantly going on about his neck problems and trying to out-quip Deadpool. I have nothing good or bad to say about Waithe, Zhao or Morisaki, though I did wonder if having the Asian character 'meditate' until he was ready to do battle was necessary. And personally, I would have preferred he become an Evangelion over a Gundam, but we can't have it all can we? Ready Player One is saved by beautiful visuals because if not for that, I would have rated it lower. This is really a film that is worth renting, but its colors and odes to pop culture would look better on the big screen. It is really into pop/nerd culture, but for me, while I like it, I am not so enamored with it that I have to know what school makes up the John Hughes universe.